The more experience a pilot has in VFR and IFR flight, the more proficient a pilot becomes. VFR experience can be gained by flying in terminal areas with high traffic activity. This type of flying forces the pilot to polish the skill of dividing his or her attention between aircraft control, navigation, communications, and other flight deck duties. 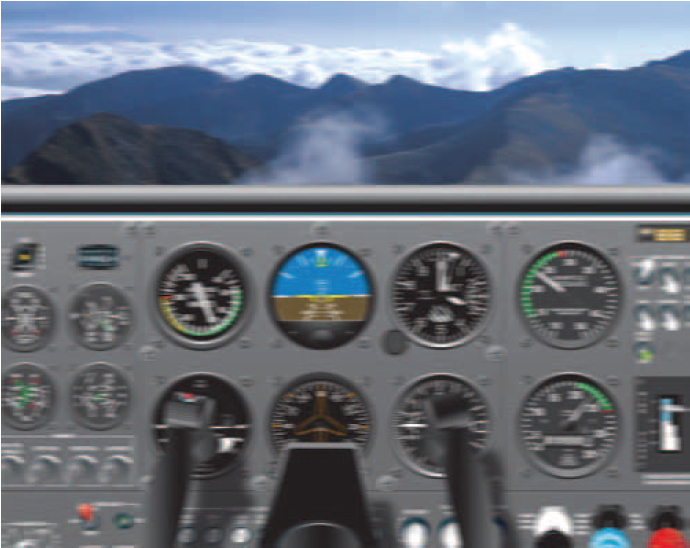 IFR experience can be gained through night flying which also promotes both instrument proficiency and confidence. The progression from flying at night under clear, moonlit conditions to flying at night without moonlight, natural horizon, or familiar landmarks teaches a pilot to trust the aircraft instruments with minimal dependence upon what can be seen outside the aircraft. It is a pilot’s decision to proceed with an IFR flight or to wait for more acceptable weather conditions. Currency as an instrument pilot is an equally important consideration. No person may act as pilot in command of an aircraft under IFR or in weather conditions less than VFR minimums unless he or she has met the requirements of Part 91. Remember, these are minimum requirements. Regulations specify minimum equipment for filing an IFR flight plan. It is the pilot’s responsibility to determine the adequacy of the aircraft and navigation/communication (NAV/COM) equipment for the proposed IFR flight. Performance limitations, accessories, and general condition of the equipment are directly related to the weather, route, altitude, and ground facilities pertinent to the flight, as well as to the flight deck workload. In addition to the weather conditions that might affect a VFR flight, an IFR pilot must consider the effects of other weather phenomena (e.g., thunderstorms, turbulence, icing, and visibility). Inflight turbulence can range from occasional light bumps to extreme airspeed and altitude variations that make aircraft control difficult. To reduce the risk factors associated with turbulence, pilots must learn methods of avoidance, as well as piloting techniques for dealing with an inadvertent encounter. Turbulence avoidance begins with a thorough preflight weather briefing. Many reports and forecasts are available to assist the pilot in determining areas of potential turbulence. These include the Severe Weather Warning (WW), SIGMET (WS), Convective SIGMET (WST), AIRMET (WA), Severe Weather Outlook (AC), Center Weather Advisory (CWA), Area Forecast (FA), and Pilot Reports (UA or PIREPs). Since thunderstorms are always indicative of turbulence, areas of known and forecast thunderstorm activity is always of interest to the pilot. In addition, clear air turbulence (CAT) associated with jet streams, strong winds over rough terrain, and fast moving cold fronts are good indicators of turbulence. Pilots should be alert while in flight for the signposts of turbulence. For example, clouds with vertical development such as cumulus, towering cumulus, and cumulonimbus are indicators of atmospheric instability and possible turbulence. Standing lenticular clouds lack vertical development but indicate strong mountain wave turbulence. While en route, pilots can monitor hazardous inflight weather advisory service (HIWAS) broadcast for updated weather advisories, or contact the nearest FSS or En Route Flight Advisory Service (EFAS) for the latest turbulence-related PIREPs. To avoid turbulence associated with strong thunderstorms, circumnavigate cells by at least 20 miles. Turbulence may also be present in the clear air above a thunderstorm. To avoid this, fly at least 1,000 feet above the top for every 10 knots of wind at that level, or fly around the storm. Finally, do not underestimate the turbulence beneath a thunderstorm. Never attempt to fly under a thunderstorm. The possible results of turbulence and wind shear under the storm could be disastrous. When moderate to severe turbulence is encountered, aircraft control is difficult, and a great deal of concentration is required to maintain an instrument scan. [Figure 10-14] Pilots should immediately reduce power and slow the aircraft to the recommended turbulence penetration speed as described in the POH/AFM. To minimize the load factor imposed on the aircraft, the wings should be kept level and the aircraft’s pitch attitude should be held constant. The aircraft is allowed to fluctuate up and down because maneuvering to maintain a constant altitude only increases the stress on the aircraft. If necessary, the pilot should advise ATC of the fluctuations and request a block altitude clearance. In addition, the power should remain constant at a setting that maintains the recommended turbulence penetration airspeed. Figure 10-14. Maintaining an instrument scan in severe turbulence can be difficult. The best source of information on the location and intensity of turbulence are PIREPs. Therefore, pilots are encouraged to familiarize themselves with the turbulence reporting criteria found in the AIM, which also describes the procedure for volunteering PIREPs relating to turbulence. The very nature of flight in instrument meteorological conditions (IMC) means operating in visible moisture such as clouds. At the right temperatures, this moisture can freeze on the aircraft, causing increased weight, degraded performance, and unpredictable aerodynamic characteristics. Understanding avoidance and early recognition followed by prompt action are the keys to avoiding this potentially hazardous situation. Structural icing refers to the accumulation of ice on the exterior of the aircraft and is broken down into three classifications: rime ice, clear ice, and mixed ice. For ice to form, there must be moisture present in the air, and the air must be cooled to a temperature of 0 °C (32 °F) or less. Aerodynamic cooling can lower the surface temperature of an airfoil and cause ice to form on the airframe even though the ambient temperature is slightly above freezing. Rime ice forms if the droplets are small and freeze immediately when contacting the aircraft surface. This type of ice usually forms on areas such as the leading edges of wings or struts. It has a somewhat rough-looking appearance and a milky-white color. Clear ice is usually formed from larger water droplets or freezing rain that can spread over a surface. This is the most dangerous type of ice since it is clear, hard to see, and can change the shape of the airfoil. Mixed ice is a mixture of clear ice and rime ice. It has the bad characteristics of both types and can form rapidly. Ice particles become embedded in clear ice, building a very rough accumulation. The table in Figure 10-15 lists the temperatures at which the various types of ice form. Figure 10-15. Temperature ranges for ice formation. Structural icing is a condition that can only get worse. Therefore, during an inadvertent icing encounter, it is important the pilot act to prevent additional ice accumulation. Regardless of the level of anti-ice or deice protection offered by the aircraft, the first course of action should be to leave the area of visible moisture. This might mean descending to an altitude below the cloud bases, climbing to an altitude that is above the cloud tops, or turning to a different course. If this is not possible, then the pilot must move to an altitude where the temperature is above freezing. Pilots should report icing conditions to ATC and request new routing or altitude if icing will be a hazard. Refer to the AIM for information on reporting icing intensities. Instrument pilots must learn to anticipate conditions leading to the formation of fog and take appropriate action early in the progress of the flight. Before a flight, close examination of current and forecast weather should alert the pilot to the possibility of fog formation. When fog is a consideration, pilots should plan adequate fuel reserves and alternate landing sites. En route, the pilot must stay alert for fog formation through weather updates from EFAS, ATIS, and ASOS/ AWOS sites. Two conditions lead to the formation of fog. Either the air is cooled to saturation, or sufficient moisture is added to the air until saturation occurs. In either case, fog can form when the temperature/dewpoint spread is 5° or less. Pilots planning to arrive at their destination near dusk with decreasing temperatures should be particularly concerned about the possibility of fog formation.